When Rebellious Bride was born three years ago, with her I set out on a mission to shake up the traditional and quite conservative white, picture-perfect way of getting married in Finland. In a country where 40% of first marriages end up in divorce and many of those recycled brides, like me, end up marrying again, that picture was in need of updating – and updating with humour, colour and creativity. Now, with Finland’s first alternative wedding guide book and website already under my belt, my career as Finland’s official bridezilla, stunt guitarist and The Bride from HEL is about to take a rainbow-coloured turn. I am delighted to be linking up with a like-minded and incredibly talented wedding dress designer from the US to literally help light up the path of Finnish brides looking for that alternative wedding day look. 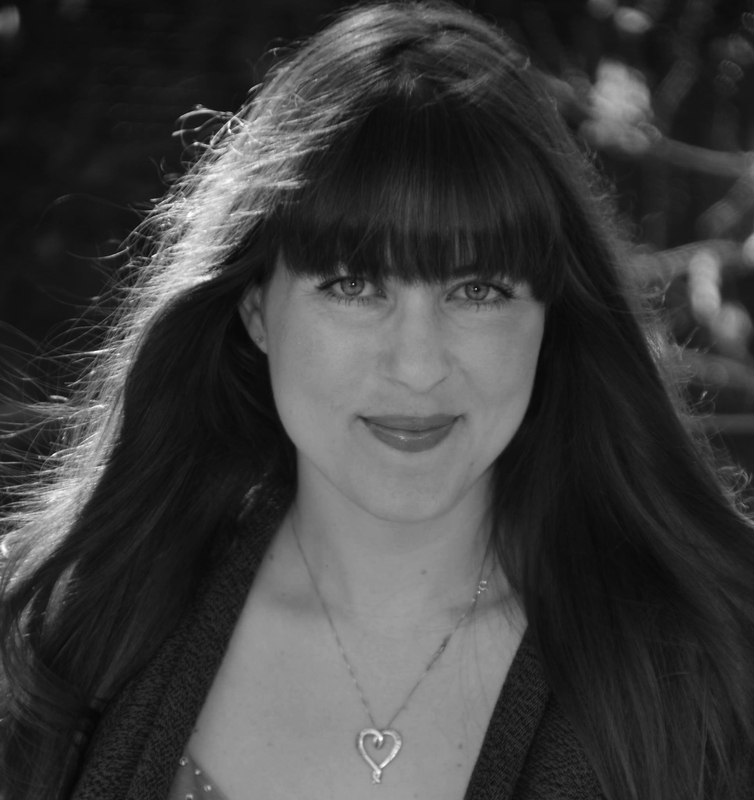 She is called Evey Rothstein, the pioneer behind Rainbow Bride from Los Angeles, California. As we speak, Evey is getting ready to send her first ever garments to Rebellious Bride, including the first light-up wedding dress Finland has ever seen. The dress is due to make its first public appearance at the Joensuu Wedding Fair on February 25th. As I am a girl who appreciates her roots, I am taking the dress back to my roots in North Karelia for Rebellious Bride’s big “switch on”. 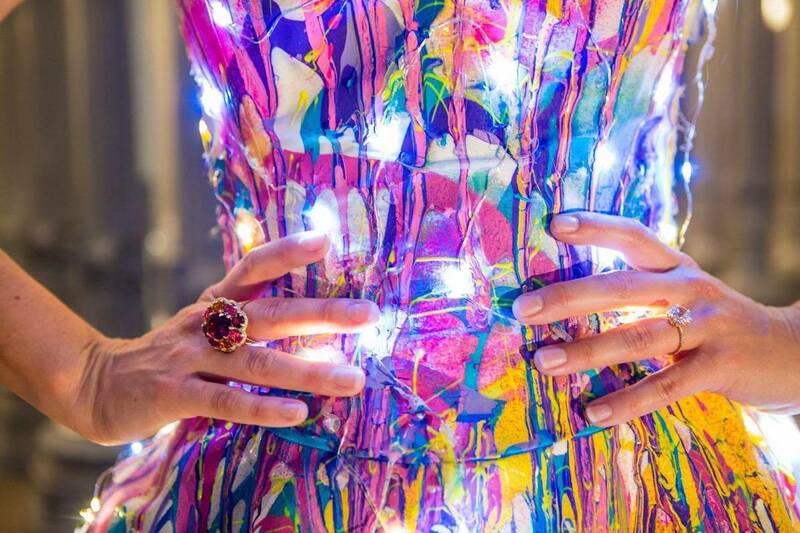 The dress is a unique piece of abstract art, inspired by Jackson Pollock. With 15 light switches it should end the dark Finnish winter! I also do Electric Veils, and specialize in dresses that are colorful. Most of my brides want a dress with pink in it – like Gwen Stefani‘s wedding dress – but some have even wanted rainbow colors, hence the inspiration for my collection Rainbow Bride, Evey tells me. I decided to splatter paint all over it Jackson Pollock style. It was the first dress I didn’t make for a client – I just made it because I felt like it. I needed a canvas and I felt like painting and a company called Simply Spray from Australia had just sent me a box of their spray paints. I just sprayed and splattered and made a beautiful mess. Famous wedding photographers have rented it. It even went to Burning Man! It got married under the Santa Monica pier, it even said “I do” under the famous LACMA light exhibit. This dress is about adventure and taking chances and being colorful and turning on the lights! It’s been married 4, 5, maybe 6 times and now its life is about to get even better! It goes without saying that I, the heart and mind behind Rebellious Bride, am over the moon – or rainbow – about this new collaboration. 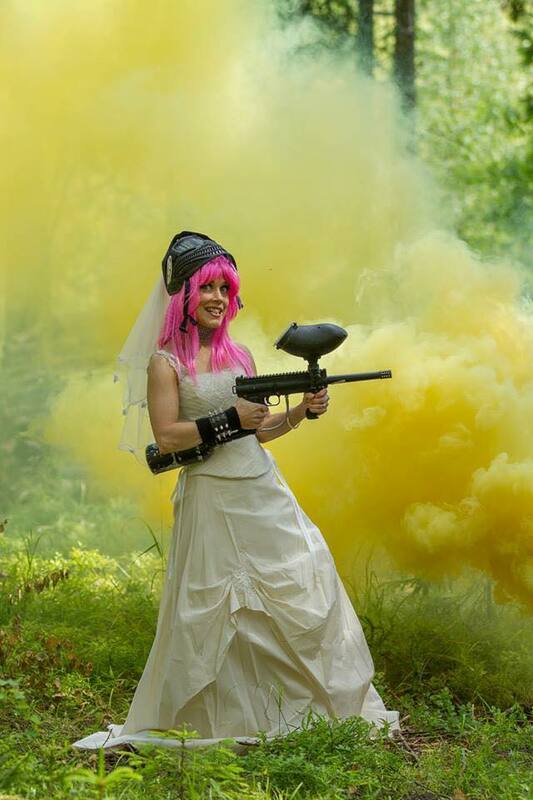 As many of you will know, Rebellious Bride has been a bit of a pioneer in wedding dress art in Finland. 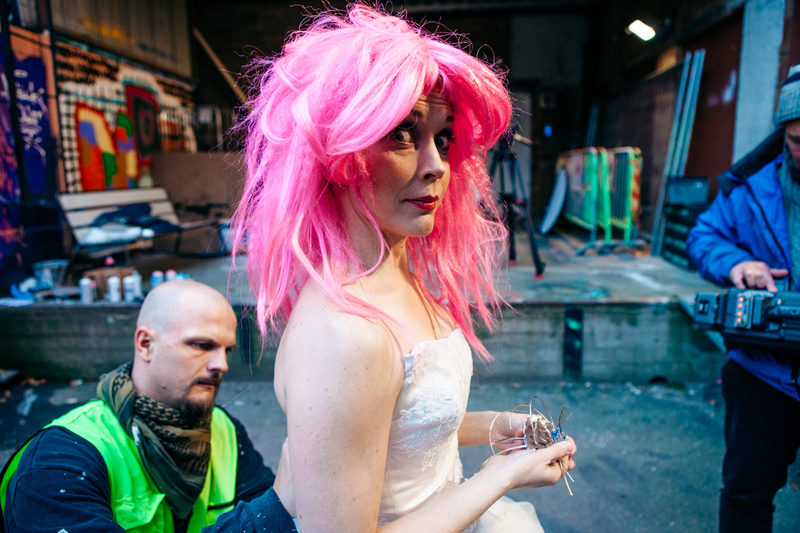 In 2015 graffiti artist Pete “Hende” Nieminen made a statement on Rebellious Bride’s Cymbeline wedding dress, as seen on this video by YLE. And of course, there is Rock The Frock, my trash the dress themed music video, among other stuff you’ll find here in my blog! Because life rarely goes as we’ve planned – mine certainly hasn’t – the best thing anyone can do is stop waiting for the light at the end of the tunnel and turn the light – or lights – on themselves. This is the message I now hope to shout out to all those brides and grooms in Finland, who really want to “go for it” on their big day but are a bit nervous of doing so. In this world where almost anyone can lead a country (!) and anything can happen anywhere at anytime, it is best to focus on the things that come most natural to us. With no fear of being too over the top or too this or that or the other. To be rainbow brides. <3 Hellyeah! Stay tuned for details on how you too can get your hands on Evey’s dresses, electric veils and tutus! Yes, she also makes the most gorgeous bridesmaids’ tutus and flower girl dresses under her label Tutu Yummy.